The location was in the lobby of a very exclusive hotel in Washington DC that maintains a wonderful set of flower arrangements on a large table in a rotunda like setting as one enters. The "Take It!" 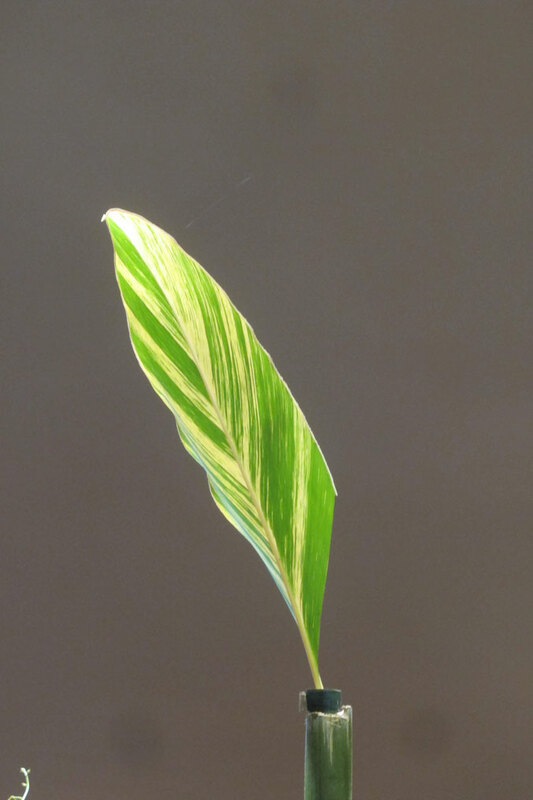 came from seeing this highly unusual feature of just one leaf placed in the end of a bamboo pole that had a barely visible water feeding devise placed in the end of the pole in which the stalk of this leave was placed. The leaf soared above the table and seemed to call for one to look at it. I was fascinated with this display of imagination. I was on my way out the door when I decided to go back and see if it could be photographed in a manner that would do it some justice. After several takes I think this gives some sense of how eye catching it was. The After Take: I have shown this to numerous people who all thought it was eye catching. They liked the color contrast with the ceiling and how unusual it was for someone to have thought of this means of presentation. I have had prints made of this photo and placed one in a note card frame. It is striking and I believe will be eye candy to who ever is a recipient. I have other pictures of leaves by themselves that while not quite as spectacular as this - are very pleasing to the eye. This is a stunning photo. It is simplistic in nature but draws in a lot to look at. How pretty! Is that bamboo? I'm not sure but the leaf is gorgeous. Did you zoom in for this photo or physically get right in there? It is a nice picture. This would make a good Windows background.